In 2001, CyDex (now Ligand) began development of Amiodarone HCL, brand name Cordarone® I.V. This work led to a Patent being granted in 2005 and in 2006, CyDex licensed Captisol to Prism. Cordarone I.V. is an FDA-approved drug that prolongs the duration of the action potential of all cardiac fibers while causing minimal reduction of dV/dt (maximal upstroke velocity of the action potential). 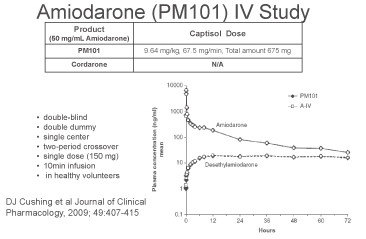 Comparison study in normal: PM101 (Captisol-enabled® Amiodarone) vs AIV (existing commercial product). Study demonstrates bioequivalence in same concentration in plasma with Captisol-enabled® Amiodarone compared to Cordarone I.V. 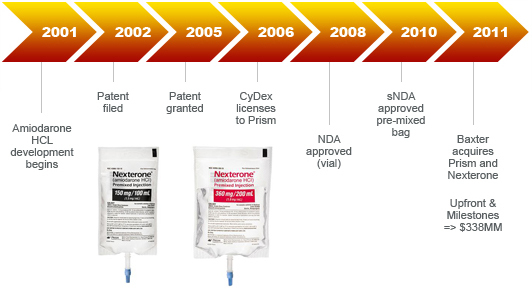 Then, in 2011, Baxter acquired Prism Pharmaceuticals and the Nexterone® product line. The deal included upfront and milestones fees that could potentially total up to $338M.